How do you get around in the woods? No, I don’t mean walking, running or skiing. What do you use for navigating when you’re out in the woods? Map? Compass? GPS? 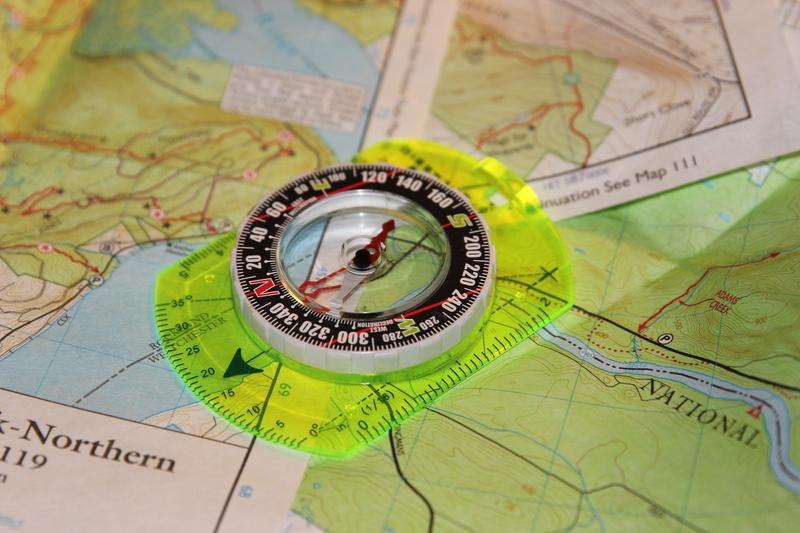 In the last couple of decades or so, navigating or orienteering seems to have become a sport unto itself, where the entire object is to find your way through the woods (or other terrain) using navigation tools. And there are entire books dedicated just to GPS units alone. So what do people prefer? I put the question to a couple of outdoors-related Facebook groups that I follow – one for hiking and one for backpacking. And I got quite a range of responses. Some people swore by having the latest GPS units with all the bells and whistles, while others were adamantly in favor of using compasses and paper maps. And some went the belt-and-braces route and used all three. My own preference, generally, has been a map and an ordinary compass (with an adjustable gauge for declination), though I’ve been learning more about using GPS units intended specifically for hiking. GPS units have been getting more and more accurate over the years, and they can help show where you are in relation to where it is you’re trying to go. But maps and compasses have an advantage in that they don’t need to have batteries charged or to have software upgraded every two months. But even in this day and age where everything is computerized, there is something to be said for paying attention to the natural signs, and knowing how to read them. There are some hiking areas where you don’t even need a compass. Consider the Palisades. In the New Jersey section, you have a pretty good idea of which way you’re heading if you can see the river and/or the Palisades Interstate Parkway. If the river’s on your right and the parkway on your left, you’re going north. Other way around, you’re going south. It’s that simple. All you need to do is remember where you came onto the trail. At other parks, where the trails are spread out over a huge tract of land, and there are multiple trails intersecting with one another, it’s advisable to at least have a map and compass with you. At Harriman State Park in just-barely-upstate New York, there is a mishmosh of trail junctions in the western part of the park that the regulars like to call “Times Square,” where the Long Path intersects with several shorter trails. I’ve got a collection of trail maps, some kept in my backpack and others on my bookshelf. You can tell which ones are used the most – they’re the ones that are dog-eared and fraying at the edges, and covered in pen marks and notations (“cool ruins here” or “gets a little swampy here in the summer”). So what’s the moral of the story here? Well, to each their own out on the trails. Use whatever you’re familiar with and comfortable with using. But I think it’s best to know how to use several different kinds of navigation tools: high-tech, low-tech and no-tech. Learn how to use a GPS unit, yes, but also know how to read a map and use a compass. And learn to look at the lay of the land and see where Polaris is in the sky.